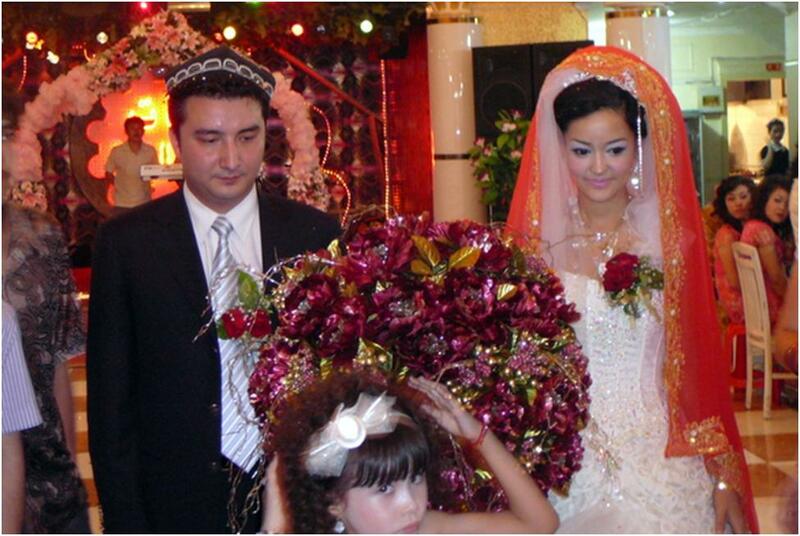 As you travel Xinjiang and meet with locals, there are a number of Uyghur customs you probably weren’t aware of. 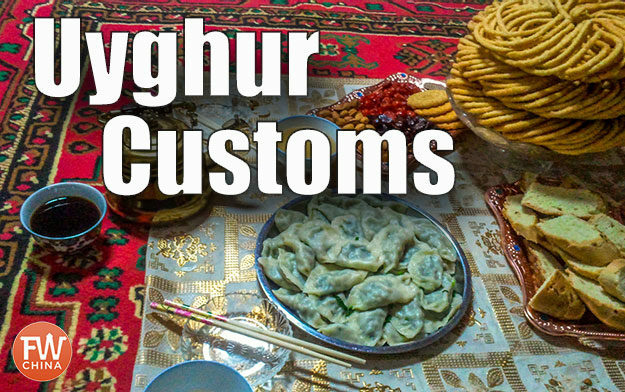 I’d love to walk you through some of the most common Uyghur customs as applies to hosting and being hosted by a Uyghur person. Enjoy! That’s not to say that it’s hard – Uyghur are some of the most kind, hospitable and forgiving people I’ve ever met – I just want to make sure I respect their culture and religion, making a reasonable effort not to offend. I don’t take credit for the following list of Uyghur customs. This is a combination of my experience, the experience of many other foreigners before me, as well as input from some helpful Uyghur friends like our neighbor. Obviously many of these general guidelines could be applied with many different people groups, especially out here in Central Asia but these guidelines are specific to the Uyghur group here in Xinjiang. 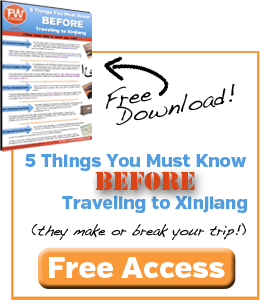 I hope spelling out these Uyghur customs helps and if you’re planning a trip to Xinjiang, you might want to check out my FarWestChina Xinjiang Travel Guide. One final thing: if you want a PDF version of this list to print out and use, enter your first name and email below. I’ll deliver it to your inbox immediately! #1 When entering a house step over the threshold, not on it. 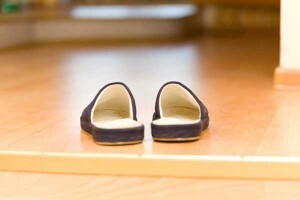 #2 Take off your shoes when you enter the house and use slippers if offered you. #3 Don’t wear these slippers on any carpets. #4 Women greet each other by touching both cheeks. #5 Men usually greet each other with either a two-handed hand shake or with one hand over the heart, slightly bowing. #6 Men and women usually don’t shake hands as a greeting and definitely don’t touch cheeks or kiss. That’s not to say you don’t recognize their presence, there’s just no need to touch. 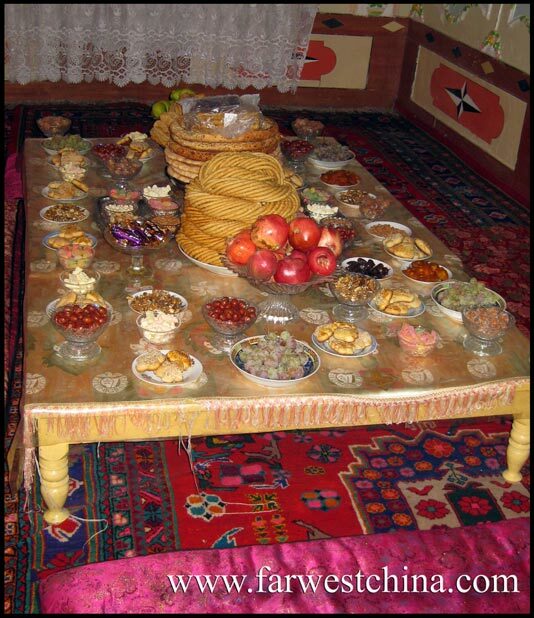 #7 As a guest entering a Uyghur home, it’s best to bring a gift – usually a nice assortment of fruit and eggs or several pieces of nan along with a few bricks of tea. #8 If invited to wash you hands, wash three times and don’t shake off the water. #9 In a more traditional setting, the host may seat you and then bring a basin and pitcher to wash your hands. Cup your hands and allow them to pour the water over your hands three times. Again, do not rub your hands or shake off the water. They should present you with a towel for drying. #10 Women shouldn’t cross their legs, especially in front of the older generation. #11 As a guest, don’t fill up on the seeds, nuts, dried fruit and cookies! The meal itself will likely be bigger than you anticipate. #12 Eat slowly and talk a lot – although not at the same time! Do this and you may make it through the meal without your stomach exploding. #13 Always stand up when a new person comes in the door. 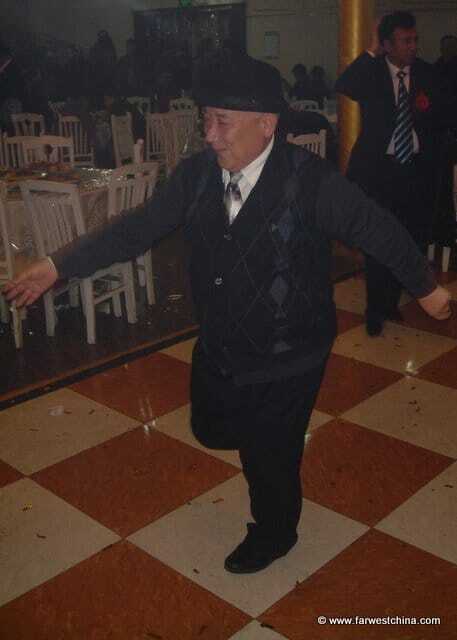 #14 Never burp or blow your nose in front of Uyghur. #15 Drink all the tea in your bowl before you leave. #16 When given a gift of food (which is common), always return the plate with something else on it. #17 The best seat goes to the guest, not the host. #18 As a host, it is customary to have seeds, nuts, dried fruits and cookies on the living room table ready for guests to snack on. 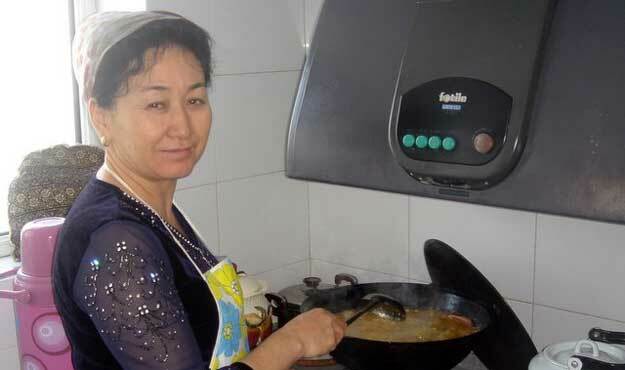 #19 When you serve Uyghur nan, it should be whole to begin with. 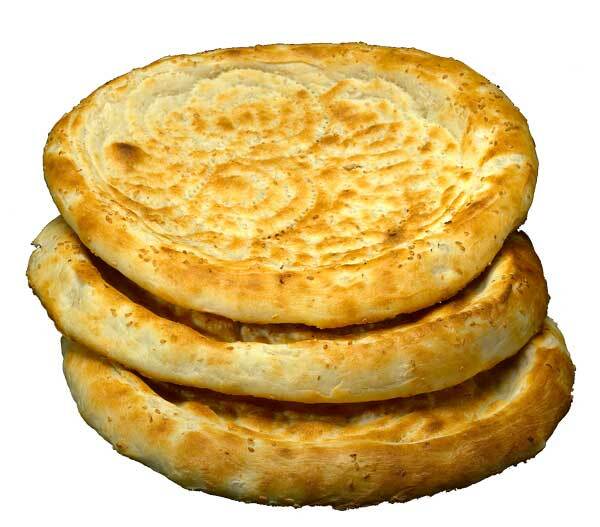 Break the nan into a couple large pieces in front of the guests. 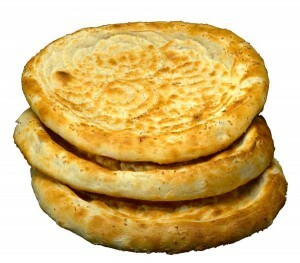 #20 Don’t throw Uyghur nan bread in the garbage. If it gets hard, just dip it in tea. If it goes bad, you’re supposed to put it out for the birds to eat. #21 Always offer tea, and try to do so in tea bowls if you have them (instead of cups or mugs). #22 Don’t used chipped bowls, though. There’s some sort of superstition about that. #23 Uyghur often “clean” their tea bowls by first pouring in a small amount of tea, swirling it around and pouring it into the next bowl. This process is repeated until all the bowls have been cleaned. This is most often done in restaurants but it’s not bad to do it in for your guests at home as well. #24 Don’t let anybody’s bowl be empty of tea! #25 It is proper to use two hands when serving (and receiving for that matter). #26 Avoid political or religious topics of conversation unless you are extremely close friends. I know some people who might find it useful to have this list of Uyghur customs printed off so I’ve decided to make it available via PDF for free. Just enter your name and email below and I’ll get it to your email inbox immediately. Have a great week and feel free to share your story of hosting or being hosted by a Uyghur in the comment section below. I am trying to find out about a custom there where you are supposed to eat your bread with the seeded side towards yourself…can you shed any light on this? Great post thanks.. Very strange customs! I didn’t know about this, i’ve been traveling already a few weeks in Azië, but never realised that my customs could be so totally different than from the population! For rule: #8 If invited to wash you hands, wash three times and don’t shake off the water. So you cannot shake off the water, to use less paper towels?